Save coral reefs by eradicating... rats? Rats have long been considered deadly pests that spread disease. They are synonymous with death, destruction and despicable and deceitful character traits. Because they are prolific breeders, rats are also known to cause enormous environmental degradation to the land. And now research has identified another reason to dislike rats: the long-tailed rodent has a negative consequence on the ocean. Aaron MacNeil, an associate professor at Dalhousie University and a researcher with the Ocean Frontier Institute, has, along with his scientific colleagues, discovered that rats are responsible for damaging coral reefs. 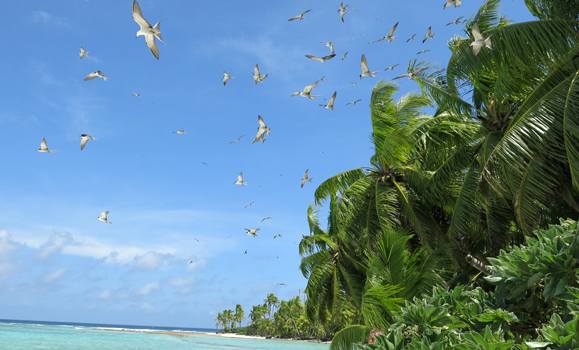 Their new study, published in the journal Nature, concludes that rat control should be an urgent conservation priority on many remote tropical islands. The coral reef issue caused by the rats, begins higher up the food chain — with seabirds. When seabirds return to their island homes they roost and breed, depositing guano (bird droppings) on the soil. This guano is rich in nitrogen and phosphorus, and as it makes its way to the sea it benefits macroalgae, filter-feeding sponges, turf algae and fish that live on, and around, coral reefs. But when invasive predators such as rats feed on the seabirds, and their eggs and chicks, the population declines and so does the important nutrients they provide to the surrounding coral reefs from their guano. Fish on reefs adjacent to the rat-free islands grew faster, and fish communities had nearly 50% more total biomass. In addition to earning accolades from Nature, Dr. MacNeil was appointed in May as a new member of the Canada Research Chair program, which recognizes excellence in science. In July, he also received the Fisheries Society of the British Isles medal which recognizes ground-breaking research and conservation. The research was led by Lancaster University (UK) with the ARC Centre of Excellence for Coral Reef Studies (Australia), Dalhousie University, Department of Biodiversity, Conservation and Attractions, Perth, Australia, University of Western Australia, Australia, Zoological Society of London, UK, University of Exeter, UK, and the International Council for the Exploration of the Sea, Denmark.